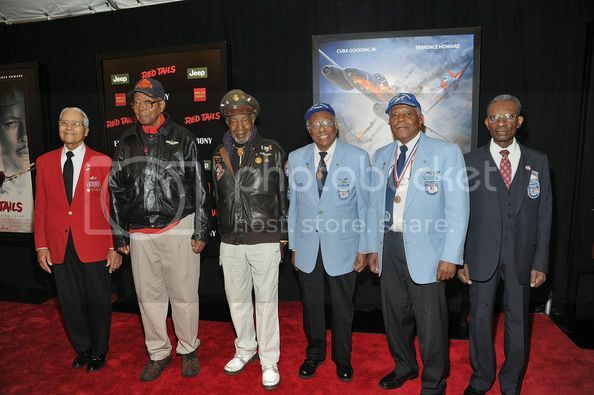 On Thursday, January 12, 2012, the Atlanta Chapter, Tuskegee Airmen, Inc., with Jeep sponsorship hosted an advance screening of "Red Tails," the George Lucas film that tells the story of the first Black pilots and their supporting ground crew in the U.S. military. Held at the AMC Southlake 24 in the metro Atlanta suburb of Morrow, the event was a fundraiser for the Atlanta Chapter, Tuskegee Airmen, as well as a viewing for "key influencers" who were encouraged to promote opening weekend attendance when the film hits screens nationwide today, January 20th. Among the esteemed guests in attendance were Tuskegee Airmen, descendants of Tuskegee Airmen, and two original Red Tails. Bob Friend, a Red Tail who enlisted in 1942, was among those men who received a standing ovation of reverence for their service. “Red Tails” was the nickname taken on by the pilots who chose to be identified by the bold color they painted the backs of their fighter planes. The movie stars Terrence Howard, Cuba Gooding Jr. and Atlanta’s own Ne-Yo, and features a cast of familiar and new faces. Jeep also figures prominently in the film, sharing the screen at times with the handsome ensemble. In 1941, leading up to U.S. involvement in World War II, a call went out from the Army to American automakers to build a fast, agile and versatile transport vehicle. Jeep answered the call and produced more than 630,000 Jeep vehicles that were used by U.S. military and their allies. Jeeps kept them moving forward on land while above the Tuskegee Airmen changed the outcome of virtually every battle in which they participated. Watch the trailer, be inspired and please make plans to see the film this weekend. The funding to bring such stories from our experience to the screen tomorrow hinges on your support demonstrated for films like this today.